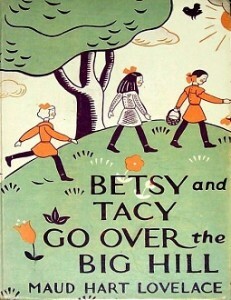 Betsy and Tacy Go Over the Big Hill was posted on September 10th, 2016 at 10.49am and is filed under Audiobooks, Blog. This entry has 6 comments. You can follow any responses through the RSS 2.0 Feed. There is great rejoicing at our house at this news! Actually, I just put the kids to bed and casually checked the blog for updates and had to run downstairs to tell everyone the good news that we’ll be listening to the Big Hill tomorrow morning when we get up! My girls have listened to your first two Betsy-Tacy recordings dozens upon dozens of times, and our Betsy-Tacy treasury (of the first four books) is worn to tatters and falling apart from all the reading along it’s gotten. Hurray for another Betsy-Tacy book to listen to and enjoy. You are an integral part of our homeschool day, so thank you, thank you, thank you for reading aloud to us! Wow! I’m glad Betsy, Tacy, and Tib are so beloved in your house :) You’ve inspired me to start the next book as soon as I possible can! We are so grateful for the next book as well. Thank you for your lovely reading. We listen to all your stories over and over again. You’re our constant companion on car rides and at bedtime. Hey, Kara! We love your readings, and wanted you to know we plan to feature all three of your Betsy-Tacy audiobooks on our site next week. Hope it brings you lots of new listeners and fans. Take care! I am so excited to find these! I’m a Librivox addict and have heard you read on Librivox, Emma, I think. I didn’t check your list of recordings because I am so excited to find Betsy, Tacy, and Tib on here!! I devoured these books as a little girl and plan to collect them for (hopefully) grandchildren. Thank you for all your hard work recording! Hi Ellen! I’m so glad you’re pleased. I love Betsy-Tacy so much! All of the Betsy-Tacy books have been reprinted in lovely paperback editions recently so you should snap them up for your grandchildren before they go out of print again. Please keep in mind that my Betsy-Tacy recordings are NOT librivox recordings — the books are not in the public domain yet, so they very are casual, unedited, friendly recordings meant for personal use only :) Happy listening!